Online review site Yelp serves as a great platform for businesses looking to connect with existing and potential customers. According to the Online Reviews Survey, Yelp ranks second among all review sites that consumers check before they visit a business. The Yelp Factsheet also reveals that 92 percent of consumers make a purchase after visiting Yelp at least sometimes, frequently or almost always. This makes it critical for business owners and marketers to claim their business page on Yelp, manage their information on the site, respond to and track Yelp reviews, and drive engagement with the site’s community of users and reviewers. Sometimes, though, you won’t have a lot of time to sit in front of a computer and manage your business presence on Yelp. If this is the case, the dedicated Yelp business owners app is for you. 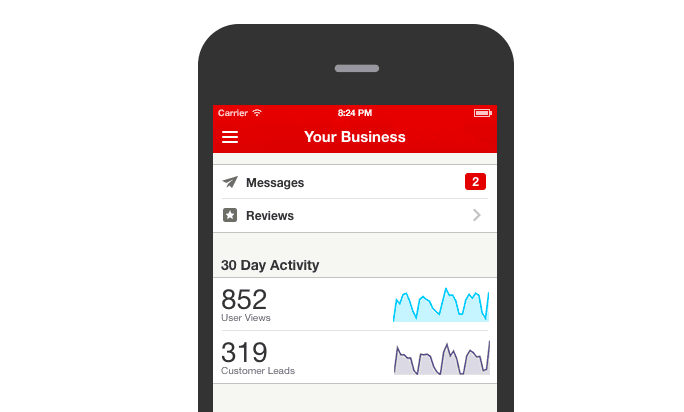 The Yelp for Business Owners app puts the power of Yelp’s business tools in your pocket. With it, you can read and respond to reviews and messages, get real-time mobile notifications of new Yelp reviews, as well as keep tabs on your business page right from your phone. Yelp’s business app can help you do more than just track Yelp reviews or respond to customers. You can also get data about your user views, customer leads, and other activity on your Yelp Business Page. Yelp advertisers can also see their Yelp Ad clicks. 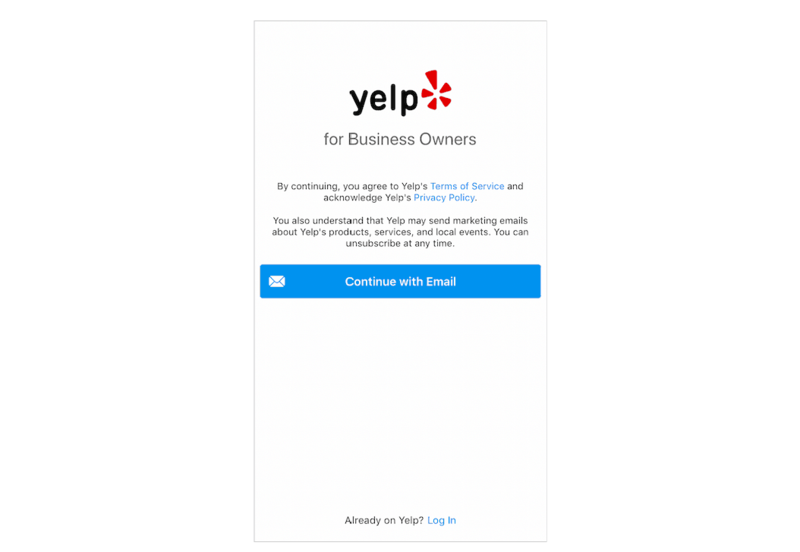 Once you have downloaded and launched the Yelp business app on your device, you will be prompted to log in. Already have a Yelp for Business Owners account? Look for the “Already on Yelp? Login” option at the bottom of your screen. Once logged in, you can stay on top of your Yelp business page by enabling push notifications. That way, you are instantly notified of new reviews, messages, photos, videos, and other important activity on your business. The Activity tab on your Yelp for Business Owners app also provides some useful customer data in the last 30 days: user views, customer leads, and Yelp ad clicks. The graphs for user views, customer leads, and Yelp ad clicks are interactive. You can tap on each graph to discover trends and patterns about your engagement and performance on Yelp. You can also tap on each graph to analyze data from the last 12 months or the last 24 months. User views is a measure of how many times your Yelp business page was accessed or viewed on the Yelp website, mobile website, and app. Customer leads serve as an indicator of users doing business with you, including phone calls, clicks to maps or directions, clicks to your website, bookmarks, and a few other actions. Multiple actions of the same type by a single user within one hour are counted as one lead. Yelp ad clicks takes you directly to your Yelp Ads tab. This tab will give you an overview of how much you’re spending on Yelp advertising, as well as several historical metrics on your ad performance (clicks and impressions). You can filter your ad metrics by period: the last 30 days, the last 12 months, or a particular month. On the Yelp Ads tab, you will also be able to view a preview of your current Yelp ad. Want to edit or update the information on your Yelp business page? You can do this on the Biz Info tab. Here, you can add or edit your business name, categories and services, address and map location, hours, phone and website, menu URL, specialties, and business history. There is also a section on the Biz Info tab where you can say something about yourself or the business owner or manager. If your business has closed, you may scroll down the Biz Info tab and look for the “Mark Business as Closed” option. Keep in mind that if you go 7 days without replying to a new message and you have not responded to any message in the past 30 days, the feature will automatically be disabled and Yelpers will not be able to proactively message your business. The More tab lets you check out the latest reviews, photos, and videos posted on your Yelp business page. There is also a Community Questions section where you can engage with Yelp users and respond to them with specific information they are looking for. You can also create Yelp Call to Action buttons by navigating to the More tab on the Yelp business app. These can help convert visitors to your Yelp business page into paying customers.